What are some of the best music industry tips leaders have to offer students aspiring to work in their field? 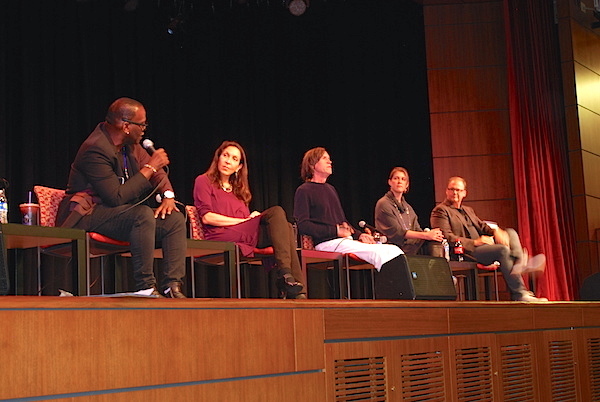 Former American Idol judge Randy Jackson recently moderated a panel of fellow music industry veterans. Their focus? How to forge a creative career in music on one’s own terms, while finding the ability to stay open and receptive to any and all types of opportunities that might arise. Panelists, who were addressing students at USC Thornton School of Music, talked about staying disciplined, being open to criticism, and working at relationships the same way one works at their music. But remaining open to possibilities served as the mantra for the evening. Rachel Fine, executive director of the Los Angeles Chamber Orchestra, shared that her career as a pianist ended early after a repetitive stress injury in college. Because she was forced to discover a “much more collaborative and social side” of herself, her professional setback turned out to be a blessing in disguise. Listen to others and try to ground your dreams in reality. And let us never forget to be relentlessly musical in our pursuits. Whether in classical or rock or even in union orchestras, you have to stay creative and you have to trust your gut. Also, don’t forget to be humble and maintain a sense of humility. If you can’t get a break through one door, knock on another door, and another, and another. — Randy Jackson, referencing pop music phenom Lady Gaga and singer Erykah Badu as examples of artists who “refused to be denied” entry into the music industry. Find your strength and run with it. There needs to be this constant commitment to quality because everyone can make noise now. Jenevieve Ting, University of Southern California senior, has written for established publications including The Hollywood Reporter, USC News, Next Magazine, The Coalition Zine, USC Chronicle, Thought Catalog, and is currently working as the online editor for the USC Thornton School of Music and as an editorial intern at Ms. Magazine.